Discussion in 'The Family Room' started by wjohn, Dec 27, 2011.
as many you may know, I restored a 1944 circa WW2 jeep. 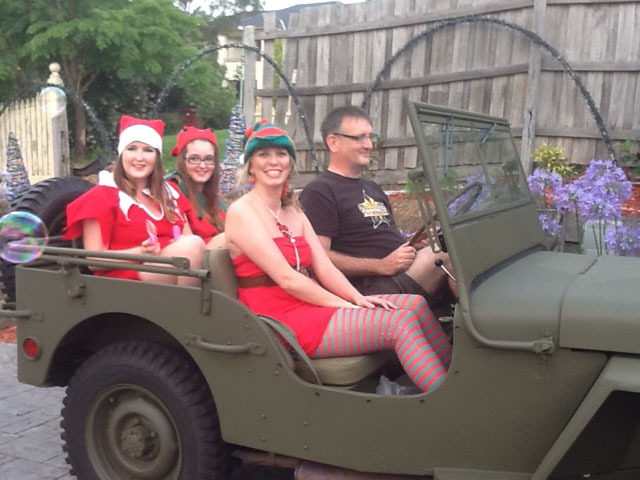 We loaded up three elves, and went out into the local area delivering Candy Canes and Beeping cars in traffic. Here is a picture of the new Sleigh, with driver and Elves. When restoring it you put the steering wheel on the wrong side. I'm sure you would have got lots of attention in that car with your helpers. I dont think it was John getting the attention.